The topic of Charlie Furbush and his elevated (but small sample) home run rate came up for discussion between Jeff Sullivan and I over the weekend and it got me thinking. That’s not true. It would be impossible for it to have gotten me thinking; otherwise I need to talk to the Red Cross about some new and unusual first aid techniques. It did direct my thinking however and the first hypothesis that came to my mind was that to wonder if maybe Furbush’s pitch locations played a part in his home run proclivity. Specifically, I wondered if Furbush was elevating his pitches. That seemed a plausible engine for more home runs. However, such an explanation relies on an assumption that elevated pitch location does in fact open up a pitcher to a higher home run rate. Usually that’s in part attributed to simply more fly balls coming from pitches above the knees and not actually an increase in home run rate as we typically (per fly ball or ball in air) measure it. I decided to look at both. Using pitch F/X, I grabbed all the batted balls and separated them into horizontal bands. 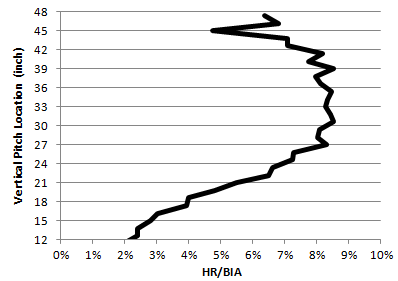 It turned out that the two plots (one using home run per ball in air and the one below) aren’t radically different. A month ago, Albert Pujols agreed to terms with the Los Angeles Angels of Anaheim. It was a deal that the media and public mostly ignored due to the intense coverage of the trade that sent Nick Schmidt to the Colorado Rockies as the player-to-be-named-later in San Diego’s Huston Street acquisition. Who could forget what a monumental day that was? Apparently desperate to get back in the limelight, Pujols and the Angels have released final terms on the contract between the two. I now will cede to their wishes and relay that information. Pujols will be guaranteed $12 million this year, followed by $16 million in 2013 and then $23 million in 2014. That’s followed up with $1 million raises each season, concluding with a $30 million payday in 2021. There’s a bunch of other stuff in there, and that’s probably what took so long to write out and agree upon. But these are the most important figures, totaling $240 million for sure over 10 years. Are home runs more likely at the beginning of games when the air temperature is typically marginally warmer than at the end? That is the question that I recall in my head, but I am unsure if it drove me to split home run rates by inning or if it formed as a question that could possibly be addressed by data cross tabbed in that manner. 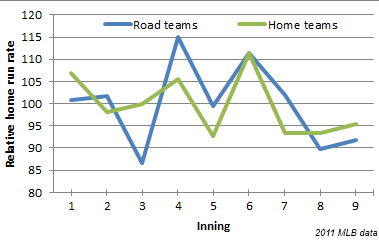 Regardless of which came first, I did end up looking at home runs per inning, but I don’t think you can say much of anything about temperature changes during the game from this. As a Mariner fan, I was searching for a distraction yesterday. The terrible news of Greg Halman’s death this morning weighs heavily and I wanted to think about anything else for a little bit. There is no proper transition to the run-of-the-mill machinations of the baseball offseason. Any attempt seems glib and unimportant; because it is. Baseball is just a game and countlessly more important things will happen and be ignored today than a rumor about Andrew Bailey, but it gave me an escape for a moment. It’s not that the rumor or tweet itself is of much importance. The Athletics are shopping Andrew Bailey around and in a seller’s market for closers, appear likely to trade him. That is hardly a surprise. 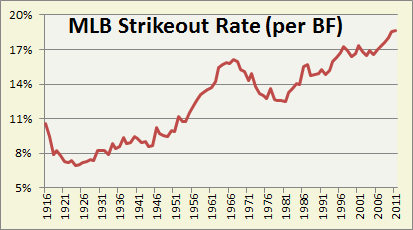 Andrew Bailey is really good and valuably cost-controlled for the next couple years. Of course teams are interested. However, the rumor kicked off a thread in my brain and I realized something. Under the new CBA, free agent compensation has changed and a direct consequence is that almost all relief pitchers will fall outside Type A now and in the future. It used to be that if you were a team that believed it to be in need of an outside closer, you could dip into free agency, but have to pay market price and likely surrender a high draft pick. Or you could attempt to trade for a closer, pay less salary, keep your draft picks and even have a chance to add some when said closer went to free agency. The Houston Astros are heading to the American League and baseball is headed toward balanced divisions (numerically at least) and 10 playoff teams. There are many fans in Houston upset at the move, but one aspect that they ought to consider being excessively happy about is the team’s improved playoff probabilities under the forthcoming new alignment. Currently baseball is a mess of uneven odds. The squads in the AL West only have three foes to compete with for a division crown while the Astros and others in the NL Central have five each. Furthermore, American League teams only have ten others to battle with for the current single wild card spot. National Leaguers must outpace 12 others in the race for baseball’s second chance bracket. Between the years of 1995 (no playoffs in 1994 remember? Good thing the new CBA’s already done) and 2012, there were four separate probabilities for making baseball’s postseason depending on which division a team played in. The Braves traded Derek Lowe in a salary dump in another seeming example of team’s not looking much beyond won-loss and ERA records. Options are being picked up and contracts are being voided. Tony La Russa retired. There is plenty of news afoot about established Major League stars and quasi-stars. This is not about one of those. A few days ago, during the World Series in fact, news came out that the Houston Astros had re-signed Brandon Barnes to another Minor League contract with a Spring Training invite. Big whoop, you think sarcastically to yourself. And you’d be correct to think so; a Brandon Barnes transaction is not worthy of a lot of hoopla. You probably don’t know who he is. Many Astros fans probably don’t know who he is. He’s a career minor leaguers who has never been rated a top prospect and over 71 games at Triple-A this past season he batted .197. During the Sportscenter running before the start of yesterday’s World Series game, ESPN did a segment on some trends associated with cold weather* baseball. The numbers discussed ranged from biometric data (your grip strength and reaction time ability both decrease dramatically in cold weather) and some of the resulting baseball numbers such as that batting average drops and errors increase in cold weather. *Link goes to one produced about football, but the same biometric data applies. I do not think any of the above should surprise you. I found it fairly intuitive. I can recall with great clarity that my fingers do not seem as dexterous when suffering from cold. What I hadn’t done before though was make the explicit connection between the biological nuisances of cold and the dynamics of a baseball game. Think about how reduced grip strength can impact a pitcher. Some of his control is going to be diminished, but probably not evenly so as offspeed pitches require more of a grip than a fastball does. And writing of fastballs, think about how an increase in reaction time affects a hitter trying to distinguish between pitches and then make contact with a 90+mph pitch. This post is not about the ongoing playoffs. I wanted to give fair warning to those that are only concerned with that. I did draw inspiration from the playoffs however. I was watching the Tigers-Rangers game during the curious third inning hit by pitch and went to the internet to see if it mattered that the pitch hit the dirt first before the player* when I began researching players proficient at finding their way on base via the plunk. When discussing players that get hit by pitches, Craig Biggio’s name is typically among the first to come forth, or possibly Don Baylor depending on the age of the people involved in the conversation. Neither of them interested me however when it comes to plunkings though and for the same reason. Both Biggio and Baylor had large strikeout and walk totals to go with their painful free passes. Baseball games are not perfect simulations. They’re not good ones, or even mediocre ones. They’re downright awful. When we design, engineer and execute proper simulations or models, we are often dealing with scales on the order of thousands of repetitions to become comfortable with the probability of the results. Baseball runs through it once. Granted there are lots of smaller, more repeated samples within the larger single sample. That helps keep some of the noise down, but not nearly all of it, or most of it. Baseball is a noisy game dominated in many ways by what is commonly called luck and people by nature are just terrible coming to grips with that.